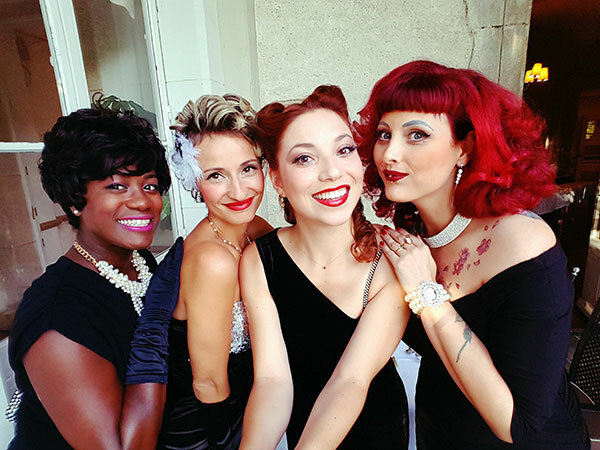 Satin Doll Sisters is a retro vocal group exclusively composed of carefully selected female voices. Satin Doll is the founder and manager of it. Since her adolescence, deeply attracted by the golden age of glamour and femininity, she knows all the subtleties of it in terms of cinema, fashion and music. Fascinated by vocal harmonies, she decided in 2014 to create her own vocal ensemble which would revisit the 30s to 60s and which would also combine aesthetics and visuals for a unique journey. 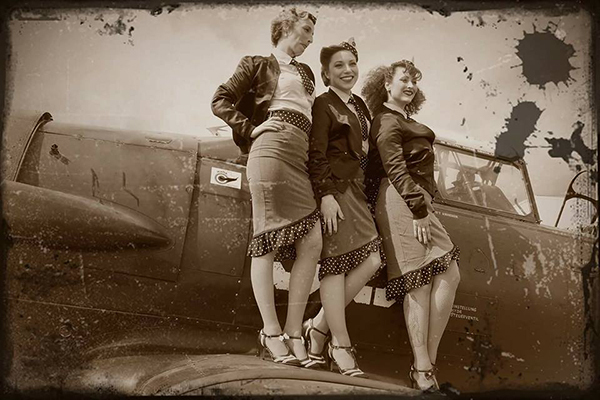 The idea was to create a trio, like the famous bands of the 40’s and 50’s like Andrews Sisters, Mc Guires Sisters, Chordettes…. 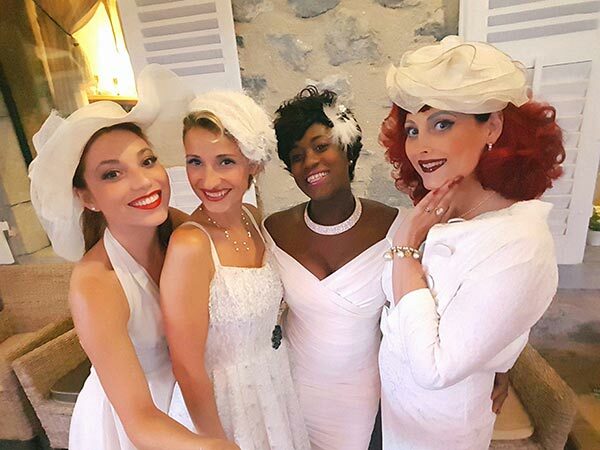 She slowly started the training by performing in small bars and restaurants in Savoy with the help of local singers, including Cherry Dolly, her childhood girlfriend, who she met in a singing class 13 years ago, with whom it was obvious that she was working. Cherry will naturally take the mezzo voice of the band while Satin will be the soprano. Satin is a bit of a field test and recruits, at first, several 3rd voices, which in turn incarnate “Missy Dolly” (the low voice and the little brunette) with whom she tries to develop the project but without great success….. She has not yet found the right personality, the sister who has the same thirst to grow with this project, the desire to travel far away with the aim of reaching beyond the borders of the region, or to invest body and soul in this project what a dream common to all. Satin is always looking to finalize his team and expand his repertoire. 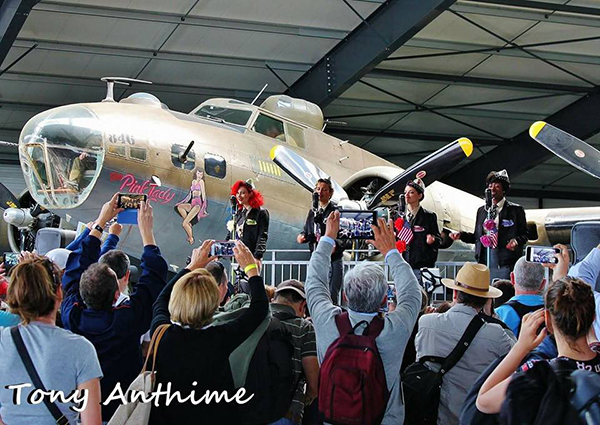 At the beginning of 2015, she formed her first real team, the one with which Satin Doll Sisters will be able to take her first flight. At that moment, she was already thinking about the idea of turning towards a vocal quartet, eager to distinguish herself from the trio of all kinds, but also in order to further enrich the harmonies. She recruited a new Missy Dolly while, at the same time, the future Sweety Dolly contacted her and wanted to join the project as a 4th voice. Satin sees a sign here, Sweety will integrate the band and will be nicknamed “the voice that walks around”, interpreting sometimes a mezzo voice, sometimes a soprano voice. From the beginning, newspaper articles and TV reports followed one another… The group aroused curiosity and gave a smile to all generations. 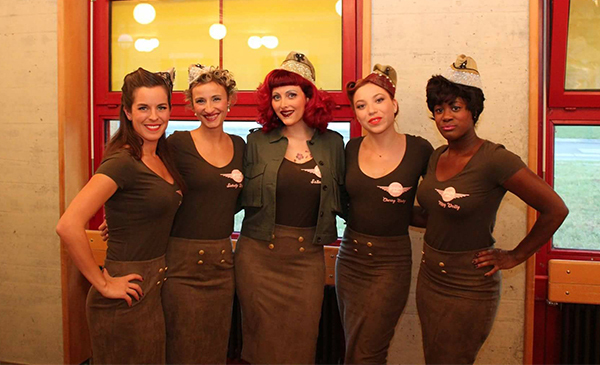 With their 25 different costumes, and a great deal of attention to detail, the sisters make you dream and travel. The group even set up a VIP club on their website, which offers advantages to its members (discounts on shows, preview videos, exclusive). 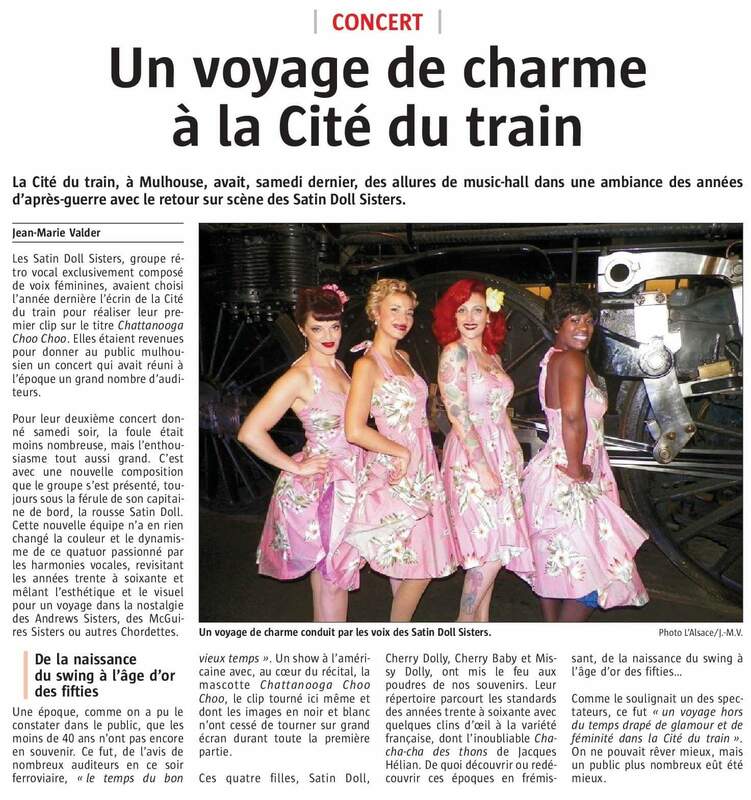 For 2 years, the formation made up of a blonde, a brunette, a redhead and Satin with red hair, travels through France (more than 100,000 km in 2 years) at the wheel of their Dolly’s mobile. At that time, their biggest fan and patron also gave them an old caravan, the Dolly’s House, which they renovated and decorated with the fashionable fifties in order to create a useful lodge for many occasions. The sisters very quickly recorded a self-produced album, on CD and vinyl in limited edition, thanks to the many donations of Kissbankers and fans, already more than 2000. This album was a real success. The sisters also take out postcards, a T-shirt and other merchandise. Always with attention to detail, the sisters’ accessories and shoes are customised to their image. Satin, becomes a producer, now endowed with the show license, she manages alongside her favorite graphic designer all the communication, acts as a manager, takes care of the financing of projects, she is also the agent of the group. 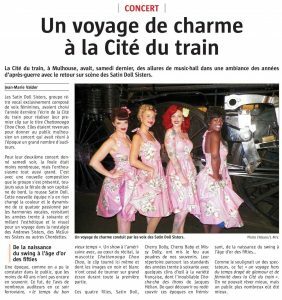 She also writes and produces a musical Christmas show for young and old, and the sisters put together a repertoire of retro Christmas carols that will allow them to sing every year throughout December at various Christmas markets all over France and into Switzerland. Here again the costumes are superb and the attention to detail around their much appreciated mobile sound system. 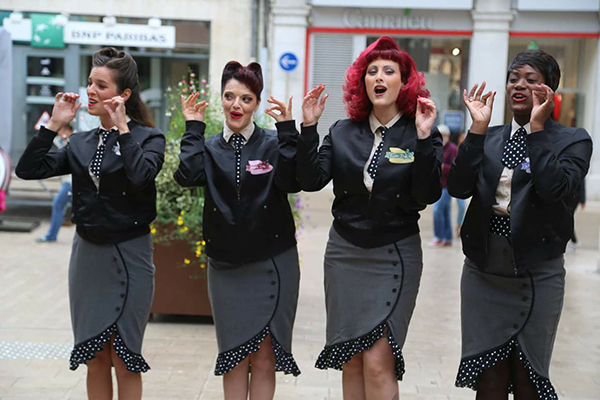 In July 2016, the first Sisters’ clip on the title “Chattanooga Choo Choo Choo”, released in July 2016, is totally self-directed and self-produced. This first video clip crosses the Atlantic Ocean, only 2 days after its broadcast and it will be shared on the social networks of Chattanooga, but also through Tennessee. The sisters then foresee the opportunity to go sing in Tennessee, which they plan to do by 2018. After several months of castings, forty or so applications and a lot of hard work, Satin is able to present the new “line up” 2017, now composed of 6 sisters! 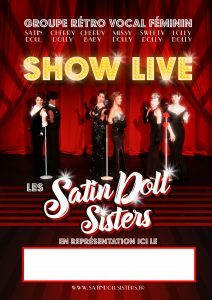 And yes, Satin has a new fad, performing from time to time as a quintet and now integrating the character of “Lolly Dolly”. The group, always with variable geometry, will perform in quintet but also in quartet or trio according to requests and budgets. The “Mezzo” voice station will now be split between two Sisters, Cherry Dolly and Cherry Baby for more flexibility and to meet demand. With this new year and these new sisters, new projects are coming in…. 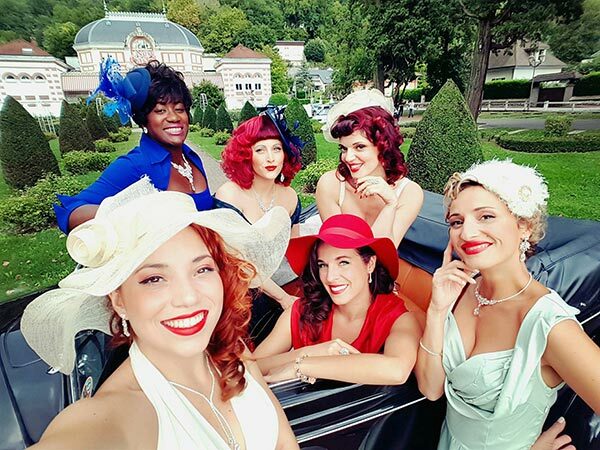 A new repertoire, a new album accompanied by a second clip, a new show “The Great Woman Revolution” in creation composed now of song but also dance and tap dancing,…. The idea is to propose a real show formula in addition to the usual concert formula. This year, the group is surrounded by musicians in order to propose a live formula, a sound engineer to work on their instrumental tapes, a choreographer to refine the gestures and work on new choreographies, an arranger in charge of writing certain vocal arrangements, a composer to introduce some compositions on their shows (at the time when Satin already writes his texts) but also a dancer. 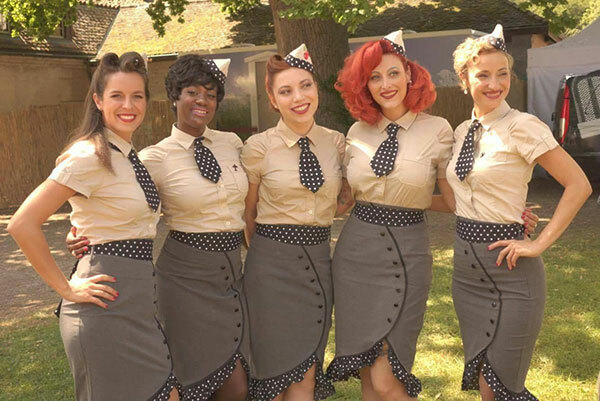 By the end of 2018, Satin hopes to find the support of a producer and a few agents to travel around Europe with their brand new show “Sweet Oldies Memory”! So many wonderful projects that will come to life thanks to this new breath that represents this new team and now almost 3500 fans who follow us regularly…. So see you here and on our Facebook page for more adventures! She has been an unconditional lover of the fifties since her adolescence, and has been at the initiative of the group she calls Satin Doll Sisters. A native of Savoy, she already knows that she wants to become a singer, but also a glamorous and elegant young woman, like the great Hollywood stars of the 1950s who rocked her childhood. She started by creating her own company dedicated to vintage makeover in order to share her universe with other women. 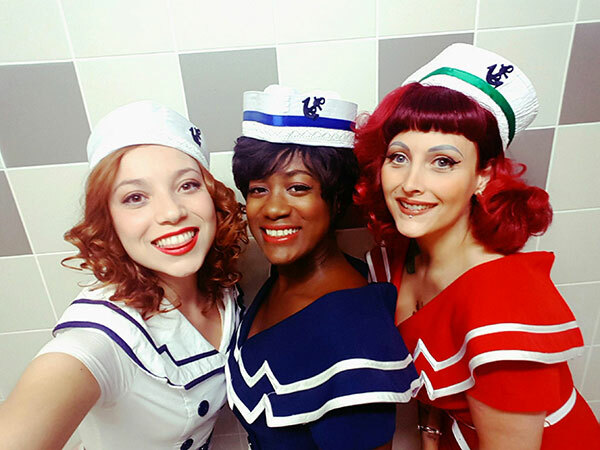 She has already appeared in jazz and variety bands and it is only natural that she decided to create a retro female vocal trio like Andrews Sisters and Chordettes. 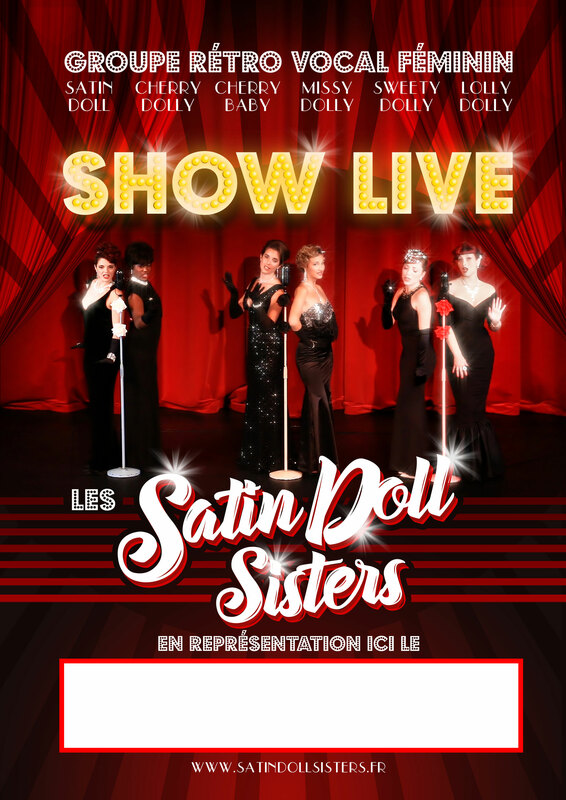 Satin takes care of the sisters’ fifties look (make-up, hairstyle and styling), the sets, the musical programming… in order to raise this trio to the top and transport the greatest number into its glamorous and retro universe. You will find Satin on all the dates ! Melanie started playing music at the age of 16. Together with her university studies and her studies at the conservatory in order to prepare her singing teacher’s diploma, she joins different groups (rock, reggae, international variety, etc.) and gives concerts in the region since then. At the same time, Melanie continues to develop her musicality through various formations: piano voice duo, homage to Michael Jackson or even Kida, her folk band. At the age of 14 she made her first scenes with her 1st group… the trio of friends then presented CABARET shows more worked (feathers, glitter, magic, singing, dancing…) and this for several years. In March 2014, at the age of 26, Marina decides to devote her life entirely to her passion and leaves her job to join a professional orchestra of varieties “MASCARA” with whom she discovers summer tours and big stages. 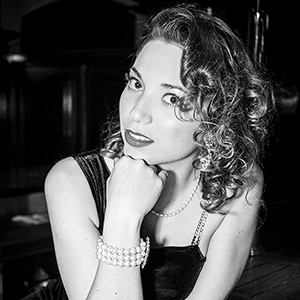 She performs in guitar/voice duet and integrates a hot swing jazz quartet “SWING&CO”. 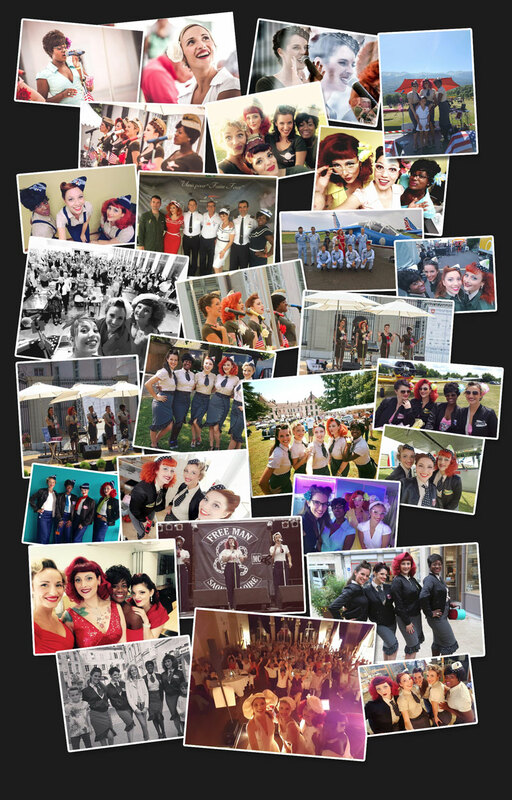 She plays in various musicals with Les Secoués du Vocal, the Fix Fox Compagnie…. She works in parallel on these original titles. Today she is working on various musical projects and is working on the final phase of her album. 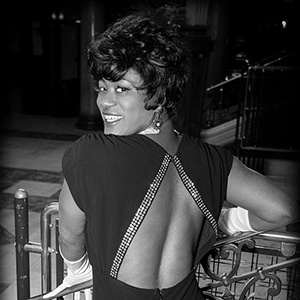 In 2018, driven by her love of glitter and glamour and curious to work on vocal harmonies, she joined the sisters’ troupe for which Satin had asked her to work several times in the past. Self-taught artist from Haute Savoie. In high school, she had little interest in music and guitar training, and was initially thwarted by her parents, but found it difficult to find her place. It is finally, rather late and in Grenoble, that she finds her “voice” in the “Grenoble Gospel Singers”, a great gospel choir that she has never left. For the past 7 years, other creations, participation in various projects as a soloist or chorister of gospel, soul or funk have brought her to the Iberian stage (Summit, Vence-scene, Grand Angle, Agora…) Always looking for new projects and evolution, it is quite naturally that she joins the Satins Doll Sisters this year, and takes the nickname “Les Satins Doll Sisters”. You will let yourself be captivated and moved by his deep, warm and mixed voice. Originally from the Lyon region, Louisy has been immersed in the musical world since his earliest childhood. From the age of 6 to 16, she learned to play the flute and the classical traverso. At the age of 12, she joined the gospel vocal quartet “Méti’s Gospel”. After graduating from high school, she decided to obtain her diploma as a pharmacy teacher and to sing in addition to her main profession with “Méti’s gospel” and for one year “Gospel Grenoble Singers”. Passionate about gospel music, she auditioned for “Gospel Colors” with whom she also sang for a year. Then at the age of 27, after living in London for a few months, she chose to return to France to devote herself to her musical career. She joined the “Jean Pierre Verdolini Jazz Band” orchestra, which allowed her to work in several musical styles such as jazz, bossa nova, swing and contemporary pop. 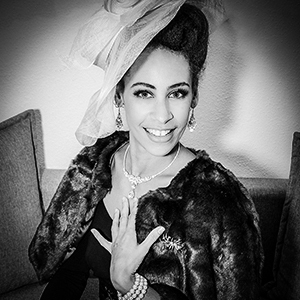 Then a new passion for swing was born and she auditioned for the “Satin Dolls Sisters” which allowed her to realize a sweet teenage dream; singing in a female vocal group Swing retro. 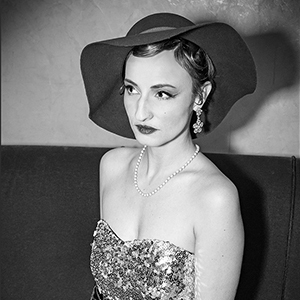 Emilie is a member of a Franco-Jordano-Italo-Slovenian family and is immersed in the world of singing, voice and sound! 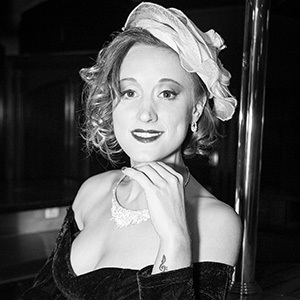 At 23, Emilie takes off, she performs in Brazil in a tribute to Piaf, sings accompanied by the internationally renowned pianist François René Duchable in a tribute to Gershwin, participates in many projects and shows mixing singing, dancing and sometimes pyrotechnics! In 2008, she joined the vocal quartet “COULEUR CAFE”, which marks the beginning of a rich human and professional adventure and which will allow her to perform in France and abroad. She is thirsty for encounters, sharing and experiences, and with “INAYA” she initiates herself to the depth and intensity of female voices, with “TRINIDAD” to the voluptuousness and complexity of Brazilian music. Then she finds with “SPARKLING DIAMONDS” a jazz quartet in homage to one of her first musical influences, Ella Fitzgerald, which she will even sing in New York at the Birdland Jazz Club in November 2011. Two magnificent tours as a choir with the tribute at Pink Floyd “BEST OF FLOYD” where Zéniths and magnificent halls like the Grand Rex in Paris. 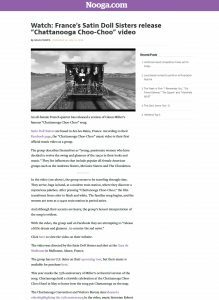 And finally, many trips and concerts with the band “MAFAMILY”, his family band that will travel all over the world with clips shot in Scotland, the Caribbean, Miami and New York. At the age of 5, her mother took her to see Céline Dion in Bercy, unable to hear her sing her songs all day long. So it’s decided, she’ll be a singer. First introduced to dance, which she practiced for over twelve years, it was at the age of 10 that she began singing in a choir. At 12, she will make her first stage experiences and her first shows mixing singing and dancing. At 16, she took her first singing lessons at the Deva music school and joined her first cover bands. In love with rock, funk and soul culture, she made it her favourite styles. After obtaining her baccalaureate, she continued her studies at the Annecy Conservatory and then Chambery where she obtained her DEM at the age of 22. At the same time, she was nourished by different projects, sang in duet, trio and tried out different styles (Superfreak-funck/disco), she discovered the work of vocal harmonies and female voices within Inaya (chant du monde) then later sang a few months with Padashti lista (chant des pays de l’est). At the age of 25, she became a professional member of the Mascara variety orchestra, with whom she toured France, Belgium and Switzerland on big stages and summer tours for over 2 years. She decided to leave Mascara to devote herself fully to her two other projects, her guitar/voice/looper duo Meltdown Melodies and Red Light, with which she makes her rock soul live. But above all his need to write and create his own music. Passionate and constantly evolving, it is quite naturally that she auditioned to join the Satin Doll Sisters. Our flagship formula! 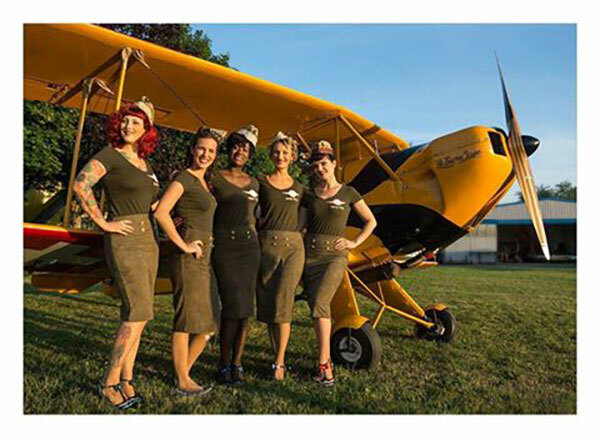 perfect for all your events, retro festivals, air shows, military gatherings or any other events. 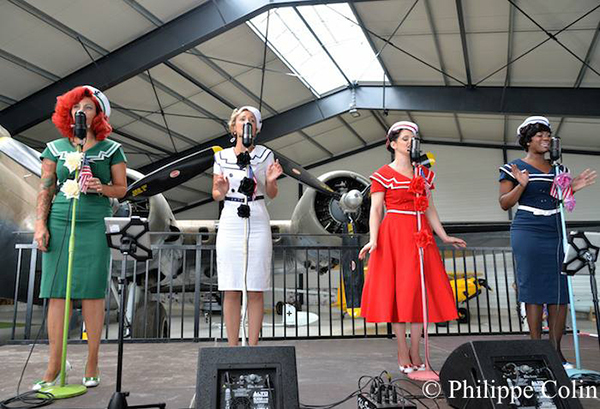 Let yourself be transported by the richness of harmonies like Chordettes, Andrews Sisters or McGuire Sisters. 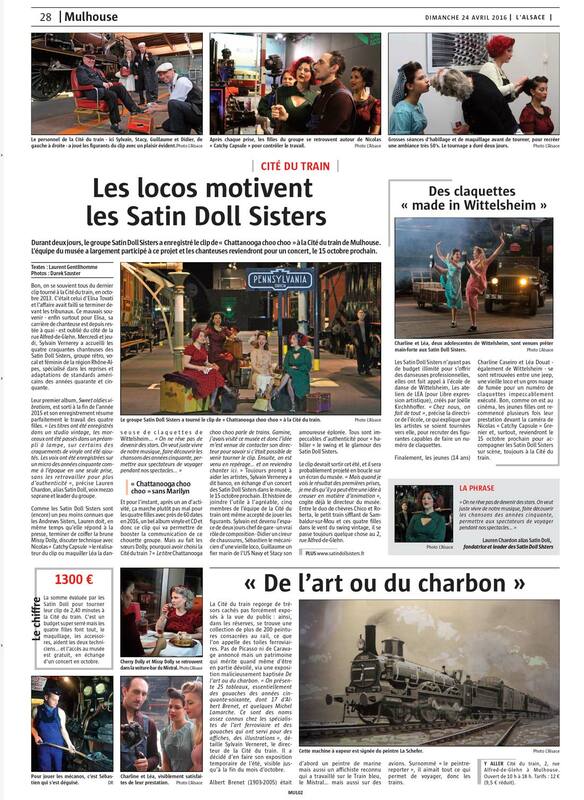 The Satin Doll Sisters take up the challenge of uniting their voices with very different tones. An explosion of harmonies knitted on the thread and accompanied by choreography. Mr Swing and Ms Boogie can accompany us on our 40’s show. From November to mid-January give your events a Christmas look. All the Christmas magic of the famous American standards (White Christmas, Jingle Bells, Silent Night, Have Yourself A Merry Little Christmas…). Wandering around your Christmas markets or as a complement to the Entertainment formula, this repertoire will enchant young and old alike. An exceptional show like the Jazz Band of yesteryear. 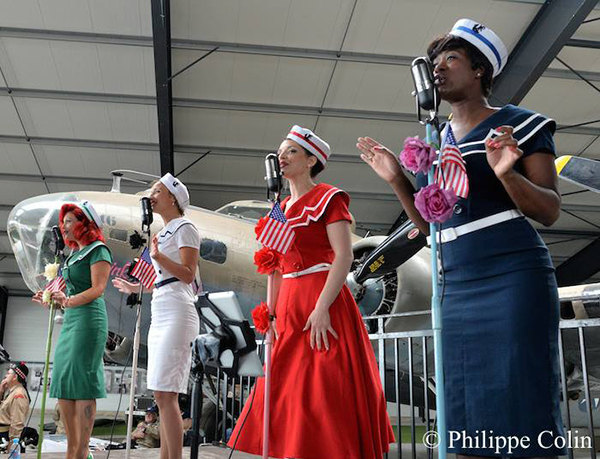 The Satin Doll Sisters are accompanied by live musicians. Choose your trio or quartet band for a retro show. Discover our Christmas show “Le Rêve de Canel”. An animated video tale, interpreted on stage by Canel le Renne. A magnificent story sprinkled with live Christmas carols in a magical setting to share the magic of Christmas with you…. Meet after the show: Canel le renne, the 3 fairies of Christmas, Santa Claus, Elébore the elf (who will make your children participate), the leprechaun but also Mr. Snowman and Pandora the queen of the elves! 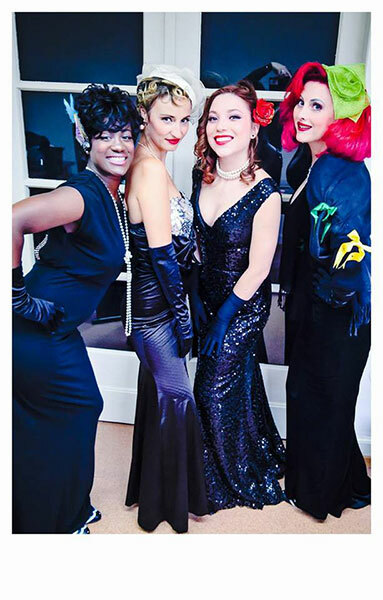 The Satin Doll Sisters will tell you the story of women through the ages, from the 1930s to the late 1960s. A show mixing audio, video projection, dance, storytelling… 2 hours of travel in the history of women.